James R. Lawrence, Jr. (Jimmy) is a partner in the law firm of Daughtry, Woodard, Lawrence, & Starling and has been with the firm since 1982. He represents the Johnston County Board of Education and works primarily in Criminal Law, Education Law, Personal Injury Law, and Small Corporations. He is experienced in both Superior Court and District Court jurisdictions as well as Administrative Hearings and has extensive trial experience in all venues. He is admitted to practice in the Federal Courts of North Carolina as well. He graduated from the University of North Carolina at Chapel Hill in 1973 and graduated from Cumberland School of Law at Samford University in Birmingham, Alabama in 1976. 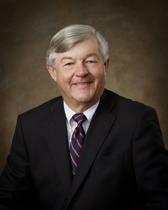 He was an Assistant District Attorney for the Eleventh Judicial District from 1976 to 1981. He then went into private practice with Daughtry, Woodard, Lawrence, & Starling. He is a former president of the Johnston County Bar, the Eleventh Judicial District Bar, and has held offices in both organizations over the years. He is a former Chair of the North Carolina Bar Education Section and a former Chair of the North Carolina Council of School Attorneys. He is still active in the Council of School Attorneys and is a standing member of the Executive Committee of the Council of School Attorneys. He is a member of Centenary United Methodist Church in Smithfield, NC and formerly served on the Administrative Board of the Church. He is married to Lillian Montgomery Lawrence and they have three adult children, all have graduated from the greater University of North Carolina.